I never hear Bach’s "Minuet in G Major” without thinking of rainstorms and long pink dresses; and after I tell you the story, you’ll understand why. 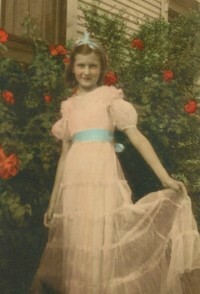 The best place to start is with this photograph of my mother at age twelve, modeling the lovely pink dress she would wear later that evening at her spring piano recital. It’s evident by her smile and her pose that she was extremely proud of this new dress (sewn by her aunt, Anna Bell), and just looking at it makes me a bit wistful for a time gone by when there was still such a thing as a "special occasion” in a young girl’s life. The sun was shining brightly, but it would not last long. Within hours of the time this hand-colored photo was taken, the sky darkened and thick torrents of rain began to fall. As water slowly filled the ruts in the long dirt road leading from their house to the highway, my grandmother became increasingly fretful, fearing that if it didn’t let up soon they might not be able to get to the high school for the 6 p.m. recital at all. It was in anxious moments such as these, I’m sure, that she most keenly felt the loss of her husband who had died when my mother was only three years old. Where was he now, when she desperately needed someone brave and strong to conquer those muddy streets and calm her jittery nerves? Long about five o’clock that afternoon, with rain still falling steadily, the phone rang. It was Mom’s best pal and fellow piano student, Virginia "Boots” Woodall, calling to say that her parents would come by the farm to pick up both Mom and her nervous mother, and take them to the recital. Angels among us! Within half an hour they were all on their way to the high school auditorium, happily if somewhat nervously singing to the rhythm of the sloshing windshield wipers. Fortunately by the time they arrived, the torrential downpour had momentarily let up. However, there still remained the challenge of getting from the car into the building without positively ruining those long lovely pink ruffles. Once again, it was Mr. Woodall to the rescue! Like a knight in damp armor he heroically picked up and carried first Boots, then Mom through the ankle-deep swirling muddy waters and onto the dry steps under the covered porch. Once underway, the recital itself was fairly typical, beginning with the younger pupils’ halting renditions of "Hot Cross Buns”; and progressing steadily upward through age and ability. Meanwhile the weather outside was anything but typical. As the level of the students’ proficiencies increased, so did the intensity of the storm. Finally it was Mother’s turn to take the stage. Following a polite curtsy to her teacher (there’s that wistful feeling again…) she sat down and began to play "Minuet in G Major”, consciously reminding herself to do it exactly the same way she’d practiced it literally hundreds of times before at home. She was almost a third of the way through her performance when suddenly there was a violent clap of thunder that knocked the power out and plunged the auditorium into total darkness! Did Mother panic? She did not. Nor did she stop playing, even for a second. After all, her fingers knew which keys to hit, even if she couldn’t see them – the result, no doubt of all those endless, boring hours of practicing the same piece over and over again, until she could play it in her sleep – or in this case, in the dark. So she just kept right on going, all the way to the end, without missing a single note. When she finished (according to my grandmother’s recounting of the story) there was another huge clap of thunder, only this time it was thunderous applause and it came from the audience. The lesson in all of this, to me, is inescapable. It was Mother’s daily diligent practice, and her complete and total familiarity with the music that enabled her to display such courage and composure in the face of unexpected adversity. The same is true, I believe, of the daily "practice” of studying God’s Word. Learn it backward and forward, upside and down, inside and out. And when darkness suddenly engulfs you, what you know in your heart will carry you through. For these commands are a lamp, this teaching is a light, and the corrections of discipline are the way to life. Proverbs 6:23. Search for Childlike Wisdom articles similar to "Practice Makes Perfect Sense. Search all articles similar to "Practice Makes Perfect Sense".